My next set of recipes uses oil mixed with Italian herbs and I thought it is good to put them as a separate post. Being in Singapore I have access to all the herbs freshly in almost all grocery shops, however I felt there should be some other easy way to make these oils as I am aware that all the herbs are not available in all places. Basil leaves infused in olive oil along with Italian pizza topper mix & garlic. The most common ingredient which is available in many places these days are the pizza topper mix which contains all the herbs in dried form hence I decided to try out with the pizza topper. Adding basil to it gave a good taste,smell and color. 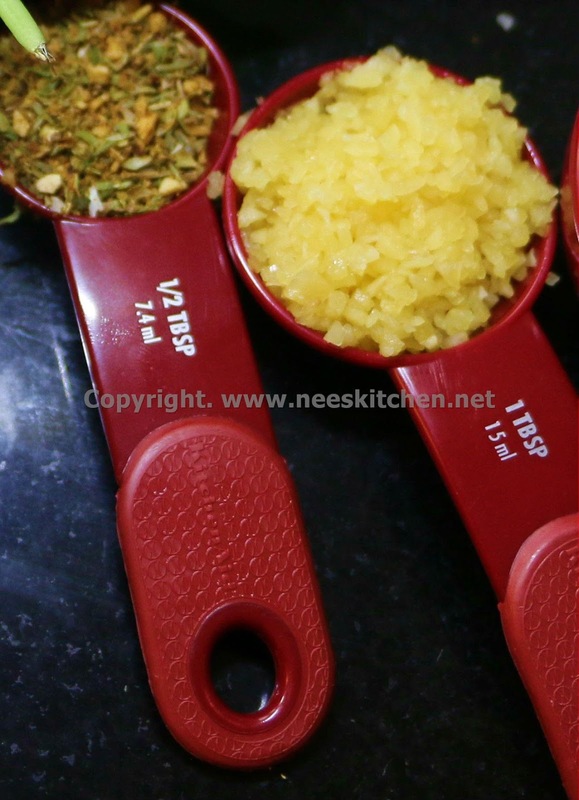 You may choose to double up the quantity if there no fresh herbs available in your place. Since I wanted a basil infused oil I decided to reduce the quantity of pizza mix herbs. However you may mix and match according to your preference. 1. Wash basil and let it dry completely. 3. Add basil, pizza topper, garlic, salt, pepper and mix well. 4. Add olive oil and let it marinate overnight. The color of the oil will change to a light green. Use it for salads, bread. You may add any herbs like thyme , dill but make sure the herbs are dry and does not contain water. I generally prepare for 4 days.